Janhvi Kapoor found herself in the limelight just recently with the release of the trailer of her debut film, Dhadak. The young actress, who suffered one of the biggest personal losses earlier this year with the sudden passing of her mom Sridevi, has been taking things in her stride as and when they come. Now, we hear that Janhvi has taken off to London to enjoy a family getaway with sisters Khushi Kapoor and Anushla Kapoor as well as father Boney Kapoor. Interestingly, though Arjun Kapoor who was already in London shooting for his next venture Namaste England, had to miss the holiday due to prior commitments. However, Arjun did manage to spend some quality time with the rest of the family before jetting off back to Mumbai. 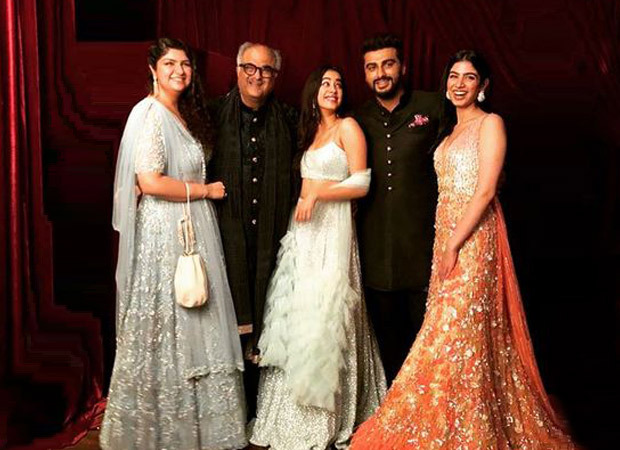 As per reports, Boney Kapoor was the first to head to London followed by Anshula and later by Janhvi and Khushi who had to first attend the trailer launch of Dhadak. Apparently, the family will spend the next week or so in London bonding and enjoying the sweeter joys of life. On the film front, Janhvi Kapoor’s debut vehicle Dhadak is slated to release on July 20. Directed by Shashank Khaitan, the film which is an adaptation of the Marathi film Sairat also stars Ishaan Khattar. The film is co-produced by Karan Johar’s Dharma Productions and Zee Studios.